iRazoo Reviews - Legit or Scam? iRazoo Reviews – Legit or Scam? 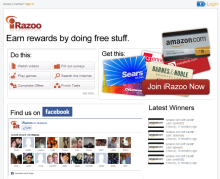 iRazoo is a rewards site that gives its members points for doing all the things they would normally do online, which members can then take and exchange for prizes. iRazoo members earn points when they fill out surveys, play games, watch videos, search the internet, complete offers, and more. You can also earn points by referring friends and family to use iRazoo as well. For every friend you refer to iRazoo, you receive 50 points, and then matching points for all the points your friend earns, up to 3000 points. iRazoo also offers Treasure Codes for their members who are Facebook fans. These Treasure Codes are worth a different amount of points and are only occasionally offered, though iRazoo members who are also Facebook fans will receive updates on their availability. Rewards networks are able to compensate their members because they collect information on you use the internet, and then this information is sold to companies or advertisers. iRazoo will sometimes provide your contact information to these companies so they may offer you deals or promotions, but if you do not want your information shared, you can choose to opt out of that feature. Do you have experience with iRazoo? If so, please leave a review below. Average Rating for " iRazoo " is 1.33 out of 5 based on 21 reviews. My reward got declined all of a sudden after 2 months of waiting. No explanation given. They gladly took my points but I have nothing to show for it. Stay away waste of time! A massive waste of time! TRASH JUST TRASH THE WEBSITE DESIGN IS EVEN A COPY OF GRAB POINTS. AND ALL I WANTED WAS A $5 STEAM USD. I HAD ENOUGH POINTS AND BOUGHT ONE AND THEN IT SEZ NOT ENOUGH POINTS> LIKE WTF!!! At first it was great, they sent payments right on time. Then suddenly, I dont get paid. They tell me that the advertiser put a 30 day hold on the payment. Fast forward 35 days. I contact them again. No reply. Day 39 I contact them again. No Reply. Day 45 I threaten to contact the BBB if they dont look in to the matter. I get a reply that my payment will be processed the following week. Fast forward 3 weeks, no payment. We go back and forth for a total of 90 days before I finally got my payment, and then the buggers shorted me by $5, so I had to request another payment, and wait two more weeks to get everything they owed me. In the mean time since I had stopped doing offers until I got paid, they stole the points that I hadn't cashed out yet. Over all, they are just really scummy. I would recommend DollarClix and Grabpoints over these guys any day. I believe this site is no longer legit. The last two "rewards" requested have resulted in one invalid link, which they never honored and a recent one was declined for no specific reason. I got declined for a large giftcard while the small ones have all gone through.I wanted to know why and they just sent a generic list of reasons why. When i told them I broke none of the rules on the list, and wanted to know exactly which reason I was declined, they basically said they're not sure. I think they just dont want to pay out. They are the definition of scam. Offers often dont credit, its difficult to get giftcards, and costumer service is just plain bad. I am done with them. I was making up to $30 a month, because I'm somewhat self-employed, but nothing is happening at the moment, but now they cut the points from 17 to 11 and from 8 to 5 points. I honestly don't know how anyone stays with them, I never qualify for surveys, so there's no way to make points anymore. iRazoo has become a complete waste of time.